You know how they say "Running around like a headless chook"? Well lately, that chook has been yours truly. I have been insanely busy and haven't had a chance to bake a thing. Usually, when you're in a rush - pancakes are totally out of the question... but what about thick, fluffy, delicious pancakes that are still thick, fluffy and delicious after they've been in the freezer. Now we're talking! 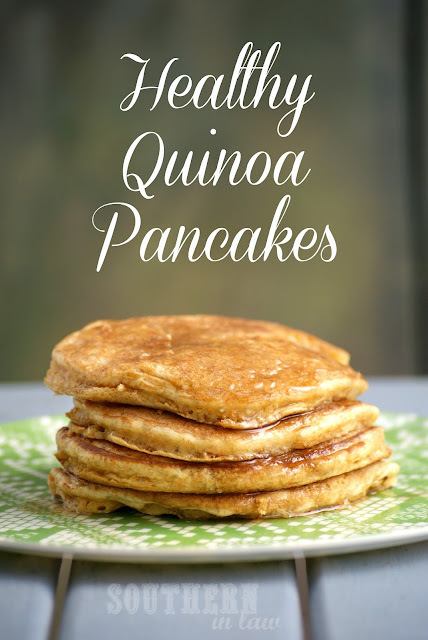 After posting my Quinoa Banana Pancakes I got dozens of requests for a similar pancake without banana - so of course I got to work and found the perfect solution that was still just as thick, fluffy and delicious. 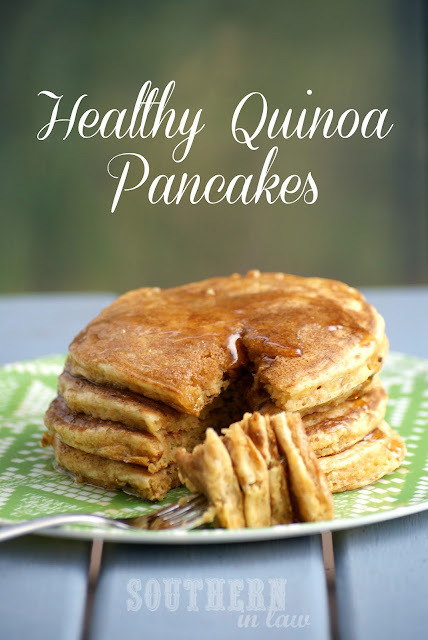 These Quinoa Pancakes are foolproof. If you're worried about being a pancake flop - don't be. For years I have struggled with flat pancakes, undercooked pancakes, pancakes that were just plain inedible - until I came up with this recipe. Even if you manage to flip them all over the place, they're still thick and fluffy. If you haven't already, cook your quinoa. Combine your flour, baking powder, salt, baking soda, quinoa and cinnamon (if using). In a separate bowl combine your applesauce, egg whites, milk, vanilla and sweetener (if using). Mix together your wet and dry ingredients, stirring until just combined. Heat a large frying pan over a medium-low heat, spray with non-stick cooking spray or grease with butter/oil. Pour pancake batter into the pan (about 1/4 cup mix for each pancake) and cook until bubbles appear on the top. Carefully flip the pancakes over and cook until golden. Repeat until all pancakes are cooked, re-greasing if needed. Serve immediately, topping with whatever you desire! *I didn't use any added sweetener as they were sweet enough - but if you like things sweet, you'll probably want to add it! But tell me, when you've got a busy day - what's your go to breakfast? Usually I'm in a rush from the get go (as we live 30 mins to an hour out of the city) so I like to have something that takes minimal preparation and can be eaten on-the-go if necessary.